Shows how to make sure your project is successful. Covers risk-management together with insights on how to plan, lead, organize and control a project. 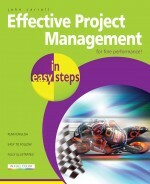 Effective Project Management in easy steps will show you how to make sure your project is successful. It focuses on the key skills a manager needs to develop for a smooth running project, and a timely arrival at the finishing line. It includes examples for most key documents such as the terms of reference, business case and project plan. It addresses team building and good communications. It covers the typical project stages with helpful lists of applicable tasks and deliverables, which effectively provides a blueprint for planning an entire project. This up-to-date primer covers all key trends in project management including a chapter on Agile Project Management. If you're a first time project manager, let this book take you through the essential project stages in easy steps, and take note of the applicable tasks and deliverables. If you're an experienced project manager, this book provides a valuable source of inspiration for making projects run smoothly and satisfactorily. Covering risk-management together with insights on how to plan, lead, organize and control a project - simply a fountain of knowledge! "Bought this book to get some tips for effective project management (without the unnecessary "chit-chat") and I must say it's great. Anyone who wants to learn quickly what are the do's and don't of PM - this is a book for you! Easy read, great value for money and delivers exactly what it says on the cover! Very happy with my purchase."